Prologic Fight Trousers, featuring exclusive Carp embroidery patches, are very comfortable and suitable for all-round wear. Perfect for Predator, Coarse, Game or even Sea anglers, these trousers are very hard-wearing and practical. They're also breathable, 100% cotton, feature 2 large side pockets and have reinforced knees. 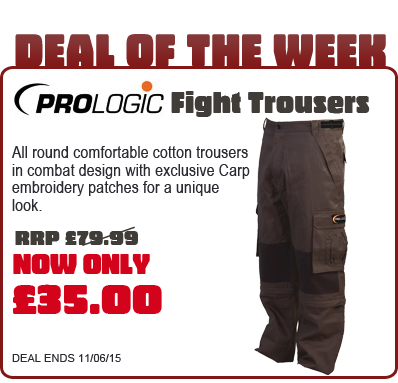 So don't miss out on this fantastic offer and grab your Prologic Fight Trousers today for less! !